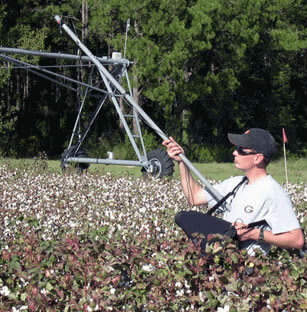 Dr. Glen Ritchie of the University of Georgia has used model PS-100 spectroradiometer to take reflectance measurements in cotton fields and estimate defoliation. Chlorophyll gives plant leaves a reflectance spectrum characteristically different from that of soil. Reflectance measurements can be reported in µmol m-2 s-1, W m-2, or as a relative value. View poster presented at ASA meeting. Ritchie, G.L. and C.W. Bednarz. 2005. Estimating defoliation of two distinct cotton types using reflectance data. J. Cotton Sci. 9:182-188.